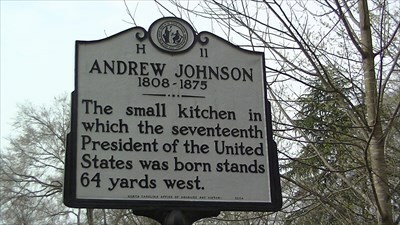 The small kitchen in which the seventeenth President of the United States was born stands 64 yards west. Andrew Johnson (1808-1875), the seventeenth president, was born in Raleigh but moved to Tennessee at age sixteen. Record of Johnson’s early life is anecdotal at best, as the poverty his family endured precluded written records. It is known, however, that Johnson was born in Raleigh on December 29, 1808, to farmers Jacob and Mary Johnson. In early adolescence, Johnson apprenticed under local tailor James J. Selby, where along with skills of the trade, he learned basic reading and writing competencies. It is widely believed an altercation with another local tailor led Johnson to leave Raleigh and travel around Tennessee and South Carolina, before returning to Raleigh in 1826. Soon after, Johnson and his family moved to Greeneville, Tennessee, where he married Eliza McCardle and operated a successful tailor shop, although his childhood poverty never ceased to haunt him. Greeneville proved to be the springboard for his political aspirations. Styling himself an advocate for the common man, Johnson was elected to the state legislature from 1835 until 1843, where he was an ardent Jeffersonian Democrat. Johnson represented the First Tennessee District in Congress for five consecutive terms (1843-1853). He then served two terms as governor of Tennessee, from 1853 to 1856, and went on to serve as United States senator from 1856 until 1862. In 1862, Abraham Lincoln appointed Johnson, by then a Republican, military governor of Tennessee, returning him to the statehouse in Nashville. Since Johnson remained loyal to the Union even after his state seceded, and through his management of Tennessee, he was named Lincoln’s running mate in the successful 1864 election. Lincoln’s assassination in 1865 raised Johnson to the Presidency, assuming the office on April 15, 1865. Johnson’s greatest challenge was leading the nation through Reconstruction. After the Civil War’s conclusion, he issued general amnesty to southerners with a few exceptions. Reconstruction policies left white elites still in power and, for many southern blacks, the shackles of slavery were replaced by restrictive Jim Crow legislature. Radical Republicans, unhappy with Johnson’s national progress, sought to undermine his power and eventually had Johnson impeached on February 24, 1868. Johnson was the first president to be impeached, although he narrowly escaped being convicted. He left the Oval Office on March 3, 1869. After his term ended, Johnson maintained political contacts in Washington for a short time. Eventually, Johnson returned to Greeneville, Tennessee, where he died on July 31, 1875. 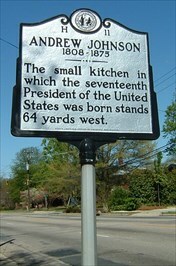 The kitchen in which Johnson was born was situated near Casso’s Inn a half-block from the State Capitol in Raleigh. It since has been reconstructed and relocated to Mordecai Historic Park where it is open to the public.